It looks like we have a few more rough days ahead of us. First, the bright side of things. Henry's pain is much better controlled. We've been adjusting his morphine drip a couple of times every day. Now, when he is awake, he says that he's not in any pain, and he seems to be sleeping more comfortably. On the flip side, Henry is running fevers constantly, generally 102-103 degrees. This concerns his doctors who plan to adjust his antibiotic regimen. He's already taking zosyn, amikacin, and fluconazole. The plan today is to increase the dosage of the amikacin, and add flagyl and amphotericin. Amphotericin is an anti-fungal medicine, of which I remember nothing from medical school except it's nickname, ampho-terrible, named due to it's uncomfortable side effects. There is now a coated form of the medicine that is supposed to have toned down those effects, so we will hope that he tolerates it well. He had a CT scan of his sinuses and chest this morning, followed by an ultrasound of his pelvis and abdomen. They doctors are looking for a source of the fever, tho most often one is not found. We haven't yet heard about the results of the studies. Henry is also struggling with multiple rashes. He has an itchy rash in his groin, we believe from one of the chemotherapies since that one has happened once before. He has a separate rash all over his chest, where we weren't able to clean as well (due to his Hickman catheter) when he was getting his four-times-a-day baths for the thiotepa. Tho he does not seem bothered by the rash, it's fairly impressive looking, and I can't imagine what would have happened to his skin without all that bathing. In addition, he's got a bit of thrush in his mouth now. He's not complaining about that currently, but does complain of throat pain especially when he coughs up some mucous. The mucous is less bloody today than yesterday, but I'm not sure why. I have mixed feelings about listing all of this information. I know that it is disturbing, and it is not my intent to keep you all up at night. But I feel a profound need to give voice to Henry's struggle, and Bryan and I are the filters through which that happens. Since Henry can't speak for himself, we need to help him tell his story. It's a story of courage, resilience, love, and strength, but it's unfortunately also a story of pain, fear, and loss. It breaks my heart to see him go through this. The night nurse just completed midnight vital signs. Henry began complaining to her that he wanted me to do his temperature, as he typically does. 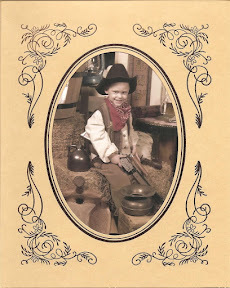 The rattling in his chest gave way to coughing and he began spitting blood. The nurse looked into his mouth and Henry's gums have begun to bleed. He continued coughing and spitting for about 5 minutes. She will check his blood again near 3am, looking for the need for additional platelets which were transfused earlier today as well. We changed his bed sheets as he's been sleeping without a diaper because of a chemotherapy induced rash from contact with it. The doctors warned us yesterday that his mucositis is going to continue worsening for a few more days. We may need to increase his pain medicine in order for him to tolerate it. We've already done so nightly for the last three evenings now before bed. As he calmed down he said, "I don't feel very good." I helped him push his pain pump a time or two. He seems to be resting more comfortably now, quietly breathing. The rest of Henry's evening went without major incident. He coughed a little more and had more to spit, but in between he slept reasonably well. He did have one more acute bout of pain this morning. Usually Henry has a single complaint but today he said that most everything hurt which prompted me to request that his morphine be increased. We've acclimated to much of what we have to do in the hospital but the effects of this chemotherapy, while we understand are temporary, are difficult to watch. It's been a bit of a rough day for Henry. We're dealing with, in no particular order: a fever, mucositis which causes him to drool instead of swallow, some intermittent nausea, and a whopper of a rash. Fortunately, there are ways of dealing with all of these things. Henry is (understandably) grumpy at times, but during his good periods is his usual sweet, inquisitive self. 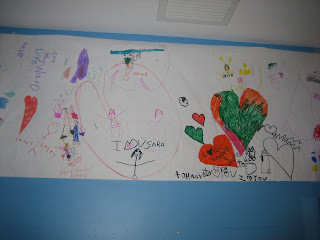 Henry misses Anna and Sophie, so we added these to their room so that we can talk to them during the day. 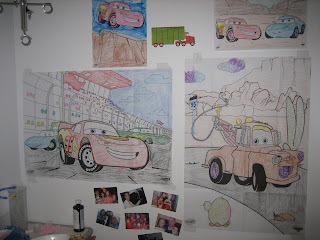 This is our Lightening McQueen wall, which everyone who comes in the room loves. This banner was sent to us by a Girl Scout Troop in Kansas. Thanks, girls! This is the biggest (and loudest) bunch of balloons I've ever seen in my life. These were sent by the billing department at Tri-State. They always send something for the walls. Henry has decided to forgo nursing school, and instead wants to be a trash collector. He graciously informed his Grandma Linda that she can ride on the back. 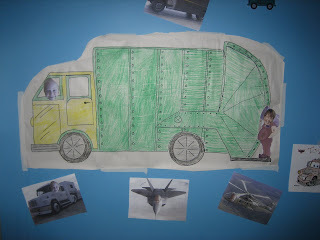 He's really enjoyed this poster, with him driving, and Grandma as sidekick. We're hoping Henry will have a better day tomorrow. It will still be several days before his white blood cells are at the detectable range. In the meantime, there's lots of things in his room to make him smile. We had ordered some new videos that finally came yesterday and it was a good thing. Henry spent all day in bed and save for his Granya and another family friend coming by, we watched TV. The videos were not the only thing that came to cheer Henry. He received some huge balloons, one of which sang the song, "Don't Worry, Be Happy". The smile it brought was terrific. Henry is now on a morphine drip to help ease some of the discomfort he is experiencing. He also has control of a bolus of morphine to help any more acute pain. Yesterday he was also started on his IV nutrition or TPA, as he's not been eating enough for days now. The cells in his mouth and esophagus are sloughing off due to chemotherapy and this creates a mucous abundance in his mouth. It seems uncomfortable and this seems to be causing his pain. In the middle of the night last night he began running a fever. His antibiotics were switched to something broader to cover any infections that may be causing this reaction. We were told to expect a fever, but had skated by without one up to now. Since we're not allowed to come home with Henry after this round of chemotherapy, arrangements have been made for us to stay at the St. Casimir House, another Believe in Tomorrow residence. Instead of telling Henry that we cannot come home, we're telling him that we get to go on vacation to this house, his images of which are likely those of their House by the Sea, a retreat house we recently stayed at in Ocean City. After we told him of this, he's now generally more fixed on going there than home, so it's been a good strategy. Yesterday Henry also received a blood transfusion which boosted his red blood counts up significantly and will hopefully improve his energy level. It looks like he'll probably receive platelets today as his counts there are below 20, the threshold for transfusion. I expect today to be another day spent hanging out in bed, just trying to keep him comfortable. I'm so proud of our boy. Things are going much better than any of us expected. There are still several days in front of us where he is at risk for fevers, mouth sores, nausea, etc, but so far he has tolerated this chemo so well. It amazes me how much abuse his little body can take, and keep on moving and lovin' life!! Bryan was on duty last night, and overheard Henry flirting with his nurse when she got him to eat part of a poptart. We figure we're getting 3-400 calories a day into him, which of course is not enough. We'll be talking to the rounding team tomorrow about resuming TPN, or IV nutrition. He did great on it last time he needed it, and hopefully he won't be on it for too long. Fortunately, he's still eating some, which helps his gut to stay as healthy as possible and will hopefully curtail some of the refeeding issues that young children get sometimes when they haven't eaten for a long time due to medical illness. The girls and Henry's Grandma Linda and I came down in the late morning. Henry and Bryan met us at the front door of the hospital on Henry's motorcycle (a really cool trike). Amazingly, he has the energy to ride all over the hospital after barely getting out of bed for a week and having about half of the red blood count that he should. You can't keep a good man down! Currently, he gets "unhooked" from his IV two hours a day, and he really looks forward to it. He handles everything so well, I think I forget how abnormal it is to be hooked to an IV pole through a line in your chest. He only shows how it affects him when it comes off. He's liberated in every sense of the word. We went back up to his room for a visit. He and Sophie immediately started playing, and within minutes they were running around the room screaming and jumping as a remote control Tow-mater chased them. It was so good to see them laughing together. Henry and Bryan took apart the toy chain saw that hasn't responded to new batteries, found a loose wire, and fixed it up. 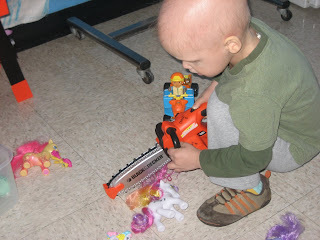 Henry then cut off various limbs of his family members, and finally decided to use the chainsaw to give some My Little Ponies a hair cut. All boy. The kids eventually settled down and bit, and Anna got in some snuggle time. It's a little hard for him after his sisters go home, but he really had a ball. We hope to get them down some next weekend too, maybe for a little longer. He had trouble eating today, but did end the evening with some ice cream that he really enjoyed. I told him that if he wanted some again for breakfast I'd get it for him. His eyes got very big and he said "That would be cool!" What a difference 24 hours can make. I came down early to relive Tara's double shift and found Henry pleasant and ready for the day. He was out of bed much of the time today. He rode the bike out in the hallway and accompanied me to do laundry and down to get my lunch. We are allowed this freedom as he was unhooked at our request for a brief period of time today. As long as he's bathed and changed before we adventure out (and refrain from touching things) we can go where we please for now, despite our 'isolation'. His major disappointment for today was not being able to go into the playroom. He cried very sadly for a time. I was able to distract him and he accepted it for now. I'm sure that will not be the end of it. We daily bring him some of the presents that we've been given for him. It's a good source of distraction and he's come to look forward to it. One of the toys he particularly enjoyed today was a game of Memory. The full version of the game I think would have been a little overwhelming so we played with them all turned face up. He enjoyed finding the matches. We played for about an hour - he was very attentive. He had some down time in the afternoon and then engaged his nurse with some play about his workbench. She indulged him very enthusiastically. He enjoyed it and I appreciated the break. Aside from being a little tired and not eating much, he was very close to acting quite normally today. A big relief from what was expected. He's winding down now in front of 'Bob the Builder' and will be asleep soon. Sleet, snow, and freezing rain seemed a inauspicious way to start an important day for Henry. Today is considered Day Zero, or the day he gets his stem cells, that were harvested from him 3 months ago, put back into his body. Bryan and the girls will be spending the day at home while Henry and I experience this next step in the journey. We both had a pretty good night. His fluids have been able to be cut back to “maintenance”, or the amount of fluids you need in a day. During chemo therapy he gets “twice maintenance” to help flush the chemo through his kidneys. We love the kidney flushing part, but not so much the peeing every 45 minutes all night part. We’re glad to be done with chemo. On Wednesday of this week, Henry and I, for entertainment purposes, had our own private “Crazy Sock Day” that impressed our rounding team. I let them know ahead of time that today was going to be “Crazy Hat Day”, and they joined in the fun! 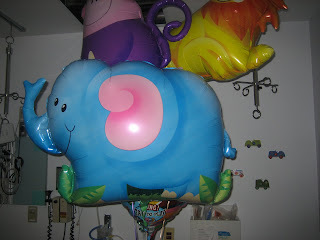 Thanks to all the doctors and nurses here who go out of their ways to make Henry and the other children laugh a little. Unfortunately, Henry had a mild case of the grumpies this morning, and pulled his doggie hat over his face the whole time they were in here. Since they left, though, he’s enjoyed talking about them and looking at the picture we snapped. We’ve gotten mixed signals on the transplant. On the one hand, everyone tells us that it’s just like hanging another bag of medication, which runs in uneventfully. On the other hand, everyone we see is saying things like “Today’s the big day!”. In addition, the nurse brought in a little baggie containing meds for cardiac arrest resuscitation and equipment for ventilation, and told me that he’ll be on a cardiac monitor for an hour before and after the transplant. I’m certain that it’s all a big better-safe-than-sorry routine, but I can’t say it doesn’t make me a little nervous. Well, the runup to the tranplant was truly more exciting than the transplant. It took about an hour of premedication and preparation to get him ready, then the 10 mL of his own stem cells ran in over about ten minutes. They've monitored his vitals frequently over the last few hours, but everything has gone great. The stem cells are stored in a preservative called DMSO, which has a very distinctive smell. The DMSO gets excreted through the lungs, so he emits a very strange odor on his breath. That should go on for a couple of days. I was mostly concerned about it bothering him, but he doesn't seem to notice it. I don't find it offensive (some people do) but I'm not planning on suggesting an air freshener line with it. The stem cells circulate in his blood for a few days before settling in his marrow, where they'll take root and begin producing white blood cells to replenish his immune system. So now we wait for that to happen over the next two weeks. He'll be staying in the hospital for safety until his body is ready to take over on it's own. After a bit of a restless night, Henry didn't awake until after 8am this morning. He ate several packages of crackers yesterday evening and wanted juice as well. I took all of this as a good sign as usually he won't tolerate anything in or near his mouth if he feels any nausea. He woke happily and has spent all day in bed. We help him go to the bathroom in a urinal to which he's become accustomed. When asked if he wants to play on the floor, he’ll reply that maybe he’d like to later. He mostly lies quietly and watches television. Our nurse came in the late morning and told us of some disappointing news. They had done a stool culture and found something called VRE. Henry has bacteria in his gut that are resistant to a particular antibiotic, Vancomyacin. In and of itself this is not really anything to be concerned about and Henry is on an array of antibiotics and anti fungal medicines that should keep him doing well. To prevent passing it on to others however, he must now be put in ‘isolation’. There are special contact precautions that all the health care workers must take now when entering the room, they must all don gloves and gowns in addition to their masks. Henry cannot go into the hallway without being bathed and his clothes changed. He is no longer allowed in the playroom, which is the biggest downside for him. Apparently this condition takes a while to resolve, particularly while resident in the hospital. His precautions will not be lifted until he can have three consecutive negative stool cultures – to be taken a week apart from each other. This purports, therefore, to affect him for the duration of our stay in and near the hospital. Today Henry played bingo. Once a week on the televisions in the hospital, the Child Life team broadcasts a game of hospital bingo. The bingo boards are laminated and include things like masks, IV poles, and urinals as the objects to cover. The highlights of the broadcast are the review of the prizes that the kids can win and the fact that they say the names of the children on TV. Henry decided that each gift was more attractive than the next until he spotted one of those pull-along Thomas the Tank Engine trains. His eyes lit up and he said, "I want that choo choo crain". Three games are played, each with 8 to 10 winners. Sometime during the first game, a child about Henry's age won and picked that train. Henry was very upset. It took me a while to remind of him of some of the other gifts with the hope that we could pull off a win. There was consolation, the prize cart comes around for all participants after the games are over, so no one really gets left out, but try explaining that to Henry. The gift he had his eye on now was a toy phone. The way to claim your prize in the game is to call the game host and read off your bingo. Each time, she would say something like 'pass the phone' and Henry thought it was his newly chosen prize being taken again. I had to explain over and over that it wasn't 'his' phone they were talking about. In the end, we had four out of five in a row, four different ways on that bingo card. There were only two winners left to be awarded. They called 'G - Bottle' and that did it for us. Henry got his phone. He was very proud of his prize and showed all the nurses that came in and promised to call them on it. In the end I think this was a better gift for him anyhow, as he's really not himself, staying in bed all day. We watched movies the rest of the day. Tonight is our last chemotherapy for this admission. No more daily EKG’s, no more midnight baths. Tomorrow we would rest and recover a bit in preparation for our first stem cell transplant. Tara here again with a status update. Henry had a nice day. He played in the playroom for a while this morning, but by noon was in bed and didn't make it out again. He enjoyed his visitors and the toys they brought (thanks, Granya and Miss Susan!). He seems very comfortable, and in good spirits, but very tired. He ate 3 cookies for lunch but after that didn't drink or eat anything more. Over the last few days he hasn't eaten much but we've been able to get some calories into him with liquids. I took his refusal of liquids as a bad sign, and was not surprised when he complained of nausea tonight. He never actually vomited, but we added a second anti-nausea drug and he settled down for the night. Hopefully he'll sleep well. We've been told to expect a fever sometime next week. His temp is normal now, but the special implanted mommy thermometer in my cheek tells me that we'll be seeing a fever sooner than that. We've also been warned that next week will be the week that he feels the worst, so we'll continue to take one day at a time and hope that he feels as good tomorrow as he did today. I don't write as often (or as well) as Bryan but I wanted to take a moment to thank all of you for the support that you've been giving us, the girls, and Henry. Henry is still doing well, although tired today. He's been lethargic this afternoon, atypically wanting to stay in bed with only token rides around the floor. He tires quickly and seems moments from dropping off to sleep at all times. He is such a good boy. After all, this is his life and his struggle. He's being forged into such a champion each day. Somehow, perhaps for the better, the time leading up to this round of chemotherapy kept me blissfully ignorant of what was to come. I fell very easily into the rhythm of our new home life and had put behind me the first phase of chemotherapy as difficult but over. Since October, I've spent the entire time beginning to absorb what Henry's diagnosis meant to some facets of Henry's life, our lives, and those of his sisters. This reflection was tossed among the daily rituals that have become normalized in our new view of reality. I felt like I'd come to a calm acceptance of day to day living within our new situation and withheld looking too far into the future for fear of becoming too attached to a positive outcome or too overwhelmed by a negative one. The several days immediately preceding Henry's most recent admission, began to weigh heavier and heavier upon me, a sense of dread mounting with each out patient visit to have him tested for his current functions so we could recognize what the chemotherapy had done to him. At some point during this time, I began to see the chemotherapy, not as medicine, but poison. We were planning to poison my son, because nothing else had any chance of preserving his life. The effects of this poison were to leave him, and those around him for that matter, scarred for life. Hopefully these scars would be minimal - small crosses to bear, the likes of which affect some at random anyhow - infertility or hearing loss for example. This knowledge and the pause before commencing the treatment, left me to stew on the possible outcomes, no longer able to preserve my shelter of ignorance. For the first time since Henry's diagnosis, I found myself angry at this situation. It wasn't a 'why us' kind of anger, but a frustrated, having-been-backed-into-a-corner kind of anger. There was nothing to do but accept it. Nothing could make me feel better about it. No pleasure to be taken that would alleviate it. With full knowledge of it's effects, we would administer this poison to our son, hoping that it killed it's target before it ravaged him. I withdrew into myself, not really understanding my feelings well enough to talk about them to anyone. Several days passed while I attempted to work this out in my head. I exercised, meditated, ate better food, tried to relax; all attempts to calm myself about it. Nothing helped. Nothing would change what was about to happen. It wasn't until I had my first turn in the hospital with him, seeing him doing well - laughing, playing and entertaining - that I was able to better accept our path. I woke up to a new level of realization and with it, a new wave of grief. Momentarily lifting my head out of my anxiety for our future, I found the effects of Henry's diagnosis rippling out to so many people, some very close and some at a distance. I realized that I've not been as attentive to those immediately around me - my daughters, what is this doing to them? I picture their sweet faces looking up at me with a sad, innocent and inquiring look, eyes welled with tears. I look at my wife and imagine us on our wedding day, never guessing what could lie ahead, wishing to avoid things like this. I see our parents being supportive but looking behind their eyes - I see their empathy for us and their own plight of having a grandchild with cancer, wanting so desperately to help or fix things and not being able to; our relatives, watching and being supportive where possible, going about their normal days only to be reminded suddenly of what's going on at odd moments throughout the day; circles of friends feeling helpless but offering such wonderful support despite it all; parents of our children's friends trying to give answers to their kids - knowing that no kid should have to worry about such things; barely beginning to appreciate the years and years of treatments those families we see in the clinic have endured and are to yet endure; watching kids during chemotherapy and seeing them colorful and playful one minute and ashen and sickly the next. There are days I feel completely inadequate to handle what's been handed us. Other days I feel capable, but wary because I know it's simply a function of time before that changes. In lieu of describing this whirlwind of emotions, my answers are brief and guarded when others ask how we're doing. I'm not sure I could describe it anyway, my emotions change at such blinding speed. When people marvel at how we're 'doing it all', I have to think, 'if you only knew'. Yes, there are opportunities for growth in all of this. Adversity does that. But it's difficult to take solace in that. It's a difficult pill to swallow that one's growth is coming at such an expense. But what are we to do? In the face of such a crisis, we pick ourselves up, arming ourselves with the comfort and support of family and friends and make the effort to take one step, one day, one moment at a time. Henry has been doing great the first few days of chemotherapy. He's been active and aside from not eating much and baths at odd hours of the day, it's not much different than being at home for him. Henry doesn't have to be hooked up to his pole right now as he doesn't have to be hydrated so heavily so he doesn't have the pole dragging behind him. He's got plenty of people to entertain him and lots of toys and distractions. We're almost done with the bathing routine. Henry will be hooked up again and will not be as free to ride the trike all over the place so easily. He'll start his new chemotherapy drug, cyclophopsphamide (cytoxan), tonight, which lasts another few days. Then he be given his stem cells. So we're hanging in there for now. Our nights aren't quite as long yet as I expected and Henry's been feeling really good. Tara here. Bryan's mom and I brought Henry down for his admission trip today. He was, unbelievably, quite eager to come. This is a testament to the fine nursing staff and child life experts who make his time here in the hospital downright fun. His fan club of adoring nurses was waiting for him to arrive. Everyone agrees that he looks fabulous - healthy, happy, and taller than the last time they saw him. He rode the Hopkins version of the Indy 500 on the oncology unit, and then had some running races with Linda and I before she left. I think he's finally tired himself out. We learned a bit more about his chemotherapy regimen today. He'll be getting Thiotepa for the first three days, which he's never had. He'll start Cytoxan on the third day of Thiotepa. He's had the Cytoxan on the first three chemo cycles as well, but never at doses this high. Thiotepa has some excretion through the skin, and is a powerful skin irritant. 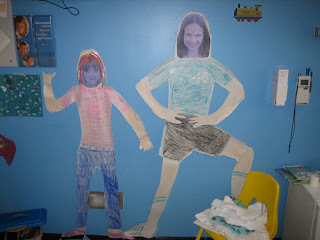 We're read in various places about the rashes and full body skin peeling that can result. Fortunately, they've recently learned ways to prevent this uncomfortable side effect. Unfortunately, it involves a full bath every 6 hours and daily dressing changes. Due to the immune suppression that he'll have, there are some nursing (and therefore parenting) issues that will be new to us this time. He needs mouth rinses several times daily to decrease the amount of bacteria in his mouth. He'll also take a week of Bactrim to help protect against PCP (a serious infection that immunosuppressed people are susceptible to) for the rest of the month. In addition, he'll prophylactically be put on another antibiotic and an antifungal medication to help prevent serious infections. In general, we've been told to expect more serious toxicities with the high dose chemo than he's had with the first three cycles. Nausea and vomiting, as well as mouth or other gastrointestinal sores are very common. The degree of discomfort varies from patient to patient. Bryan and I are both nervous to see how Henry's body can stand up to this onslaught. It sounds like he handled the first three cycles better than a lot of kids do, so we're hopeful we'll continue to have the same luck. Henry's high spirits keep us all aloft. We hope that he'll continue to feel well through this next few weeks. He's quite full of energy now, so if you wake in the night to the sound of hollering, it may just be Henry's 3 am bath. So the oncologist called today and told us that tomorrow would be our admit day. It's what they told us to expect, but with the insurance as the critical dependency, I was kind of hoping for one more weekend. I told the girls and Henry. We'd be gone for about 2 months at the hospital, that we'd try to work out visits to see Henry there. Anna teared up a bit - it gets to her when we're not here consistently and despite being 'annoyed' at him, she misses Henry when he's away. My mother is here and has been since Tuesday. It worked out well that she was able to experience energetic, happy Henry before this all starts up again. She's missed some of the best time with him but I'm glad she had a couple of non-hospital days around the house here. I have this strange conflicting irritation with the kids' minute-by-minute demands whenever we are expecting the hospital. I get frustrated with myself for it, because I feel I should be more patient and appreciative of them at such a time. It's so tumultuous the swirls of emotion rushing around in my head. I can feel it in my chest at times too. Henry was more or less nonplussed by my mention of the hospital today. "Will I get to play in the playroom? "Will they hook me up?" "That's OK - I'm used to it." Lately Tara and have had the uncomfortable feeling of having received good news regarding Henry's MRI, but having a sense of unease and foreboding. We've presumed it's been because since Henry's diagnosis, we've looked no further than the MRI to prevent our imaginations from running amok with the possible outcomes. Since the MRI, we've suspended our planning a bit in favor of awaiting some additional information about the future of Henry's treatment. Today we went to Hopkins to meet with the transplant doctor and our primary oncologist. There were a couple of quick tests that Henry required today and with insurance approval finally in place, went off without a hitch. He received a CT scan of his sinuses and a chest x-ray. Both to check for latent infections and the x-ray to ensure his catheter placement was still true. Henry has become a pro at these. With the testing out of the way, we returned to the outpatient clinic to meet the doctors. Having a child with cancer alters your dreams. It changes your perceptions of the world, the people you interact with and the long-held beliefs about everything from what one should expect from everyday life to the metaphysical questions of why we're here. When you laugh, you wonder if you're really allowed. When you cry, you do so more often and for many different reasons. Today we were given a glimpse of the road ahead and there are significant mountains to climb, the descent from which only a few make. High dose chemotherapy is required for someone with medulloblastoma, especially with an anaplastic cell type. Left alone, chances are extremely high that the cancer would return. Henry's regimen will include two additional rounds of chemotherapy, each with their own recipe consisting of differing agents. The use of different agents decreases the likelihood that a cancer cell may have resistance to the chemotherapy drugs used. Near term, Henry will likely face the loss of a significant enough portion of his hearing that he will require a hearing aid. One of the drugs used has already shown Henry's susceptibility to it and we will need to use a much higher dose to have the best chance at eradicating his cancer, but only for one cycle as its planned now. This judicious use may prevent total hearing loss without compromising efficacy. Henry will be unable to return home for the duration of his chemotherapy. He will spend 3 weeks in the hospital having the therapy administered and his stem cell transplant. Whereas in the first three cycles, his system had its nadir for approximately 4 days, during this treatment, his system will be compromised for much longer during which he'll stay in the hospital as the risk of leaving is too high. We will then be discharged but because of the state of his immune system, he must be within a quick drive to the hospital and therefore must stay nearby. This will be true after our final discharge after the second high dose cycle as well. The chemotherapy will also break down his immune system's memory for many months. He will have to be re-vaccinated in about a year's time. Long term, Henry will likely be unable to have children. He will be susceptible to other malignancies as well, such as leukemia or skin cancers for which he'll have to have annual systemic testing. After these two cycles of high dose chemotherapy, a similar battery of tests will be performed to assess the state of Henry's cancer. We cannot hope for a better reading that that of late, the best result for Henry's type the transplant doctor said he's seen. So the best case scenario is that we can find no evidence of the cancer cells, but even that result does not eliminate the possibility. Recurrence is the fear for any cancer patient. So then, we wait. We will find out soon, exactly when we start this journey. I'm sure it won't be without its obstacles - some of which we've already climbed or skated past. As for Henry, we're planning on holding his hand up and down every mountain. We drove back into Hagerstown today amidst some strange weather. To one end of the sky there was large cumulus clouds with the sun peeking through and to the other were threatening amorphous clouds covering the sky. Neither seemed too pleased to meet one another as the wind was howling and there was no predicting which would have the better of the day. Our time at the beach was relaxing. Despite some minor stomach ailments with the girls and chilly breezy weather, we found enough to do to keep us entertained. 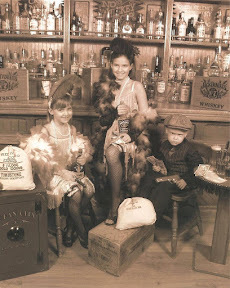 We went golfing indoors and took the kids to get their photos done at an old-time photo shop. We attempted a walk on the boardwalk but it was just too windy and cold. It turned out to be sufficient for much of the time to hang out in the provided housing. 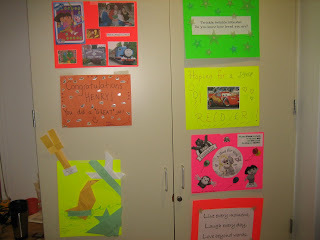 We played games and did a couple of crafts and puzzles. Being removed from our home environment for a while, without all the usual distractions seemed welcome by everyone. We ended up forced to look at each other with little to do and we enjoyed it! The first night we were once again treated by the kindness of strangers. We've had several folks come by the house lately. Some with toys, money for gas, and others with messages of hope. As much practice at accepting these as I think I've had, it's always a surprise and I never really know what to say, beside the obvious 'Thank You'. I feel forever inadequate trying to convey our gratitude. At the 'Believe in Tomorrow: House by the Sea' we were greeted with great smiles and a basket full of coupons and free dinner and activities donated by local merchants. When going to dinner at 'La Hacienda' that first evening we were treated so well and they made a point of wishing us the best. It was very touching. I'm forever amazed at the sources of our community of support. So while we contemplate the coming months of chemotherapy and what else is to come, we see some grey skies and some bright but we're entirely unsure of the outcome. In the meantime we've been able to hide from it for a couple of days and are preparing to face it together. Wow - yesterday was a long day at Hopkins for not having more to do than we did. A couple of our tests have even been postponed until next week. All that we had to do yesterday was get Henry's hearing test and a special treat that had been arranged for us. That special treat was a photo shoot done by Flashes of Hope, an organization that provides photography for children with cancer. They provide the photo shoot and all the proofs to the family at no cost. I didn't really know what to think of it at first, but as with all things, I came to find out that the people doing this really had their hearts in it and once I saw some of the sample photos, I realized what a valuable gift this would be. Henry did great with the photos and they had me sit in on a couple of them with him too. It was very touching. He ate up all the attention they were giving him. There were clowns there to entertain those waiting and to draw smiles out of the children being photographed. Henry really pushed the clowns to their limits, "Daddy, ask the clowns if they have any more cricks". We'll share the photos once we receive them, about 4-6 weeks. We grabbed some lunch at the cafeteria and headed over to Henry's hearing test. It seems he's lost a little more hearing, one more pitch, the audiologist told us. Apparently the drug can continue to affect hearing for up to 180 days after the treatment. The dosing to come is what is worrisome, but we'll deal with that as it comes. This news came alongside some other good news, all the tests that Henry had Tuesday came back negative - meaning that no sign of the cancer was present in his spinal fluid or in his bone marrow. His EKG and echo were normal as well. So far so good. We're still scheduled for continued high dose chemotherapy because these tests, while good results, are not fully conclusive as they're samples. 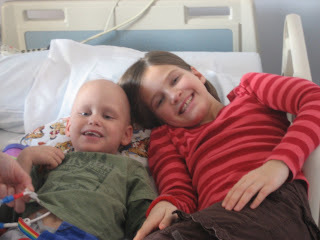 We keep reminding ourselves that Henry's type of medulloblastoma is anaplastic, a very aggressive subtype. All that it takes is one cancer cell to persist and we'll have major setbacks. Talk about a needle in a haystack. Seeing 'life-threatening' checked made me realize the kind of denial that we live in. It shouldn't have shocked me to see it, but it did. Anyway, before Henry and I left the building, the wonderful social worker chased us down and announced that we had a house at the beach for the weekend. So today we're stealing the kids from school early and will take off for Ocean City. It will be a nice quiet weekend away before starting this second phase of chemotherapy, a retreat of sorts to let the kids be kids before we ask the girls to shoulder the burden of being shuffled around for the months ahead and Henry to endure his treatments. It was early to bed for Henry last night as we had an early start this morning. We arrived at the clinic before the receptionist and early enough that we got to feed the fish. His appointment was for 8:15am to draw blood and prepare him for his first test. Today was to bring a lot of testing. For the first test, Henry was atypically resistant to the nurse's attempts to get him up into the bed for anesthesia. Henry's a good judge of character and I had already assessed this nurse as being a bit brusque. Fortunately the anesthesiologist, whom we've had - and liked - before, offered to give his sedative in his stroller through his tubes of course. He was quickly asleep. Mercifully, three of the five tests Henry was to have today would be done during this sedation. Two of the tests, the bone marrow biopsy and the bone marrow aspiration, comprise the bone marrow examination to check for metastasis of the medulloblastoma. The product of this test must be sent to California for processing. The other test during this morning sedation was his lumbar puncture. He awoke from these after about half an hour of rest and was very pleasant and didn't complain of any pain the rest of the day. We grabbed some lunch and spent the afternoon taking care of his heart tests. He had an EKG and an echo cardiogram. The former is quick, the latter is long. Luckily they are very kid-friendly there and put on a kid video for him to watch during this procedure. The technician seemed to think everything looked normal but the formal report will be available to our doctor soon. We headed home after our day of tests and stopped for Chik-fil-a. After not eating all morning, Henry made up for it the rest of the day with pizza, chicken and gummy worms. He remained in a terrific mood the rest of the day. I crashed when I got home and woke up for dinner - Henry was still going at 100 miles an hour. It's just been about 10 minutes ago that he finally quieted down. Tomorrow we are to collect a 24-hour urine for him to test his kidney function. I tell Henry that the nurses love to see his pee! Thursday we'll have a CT scan of his sinuses to check for infections, a chest x-ray to ensure that his catheter is still well placed, and another hearing test to project any additional or potential hearing loss. 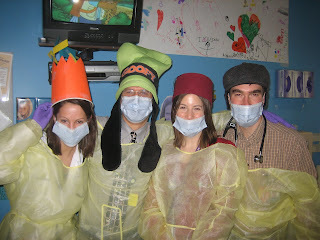 I think back on our first chemotherapy and how Henry wouldn't even wear the mask outside the hospital room to go play. Now he tells us when he needs the mask, he goes for hours without eating to prepare for testing, and places vials on his catheter to draw his own blood. What a change! We're so proud of Henry! Our past several weekends have been a mixture of all things. A couple weekends ago, we had a relaxing, laze around the house kind of day, where despite all being cooped up inside we were laid back and didn't get on each others nerves. The weekend that followed was not the same story. We attempted to interrupt the downward spiral with a trip to DC and the Air and Space Museum, but that was useful mostly for occupying the majority of the day and moving our family togetherness beyond the confines of the house. This last weekend, we scheduled some fun family and friends time and tried to take last minute advantage of Henry's ability to be out and among other people. On Saturday we had some family friends over to visit as well as Tara's sister's family. The little boys enjoyed playing together while the adults chatted. In the afternoon we took a trip up to Mechanicsburg to spend some time with close friends and their twin girls, who are roughly Sophie's age. Once again, the kids played and the adults talked. A good time was had by all. Saturday night, Henry was once again the victim of steroids. Although he'd had them on Friday (nausea prevention) they must have still been in his system. He woke up at 12:30am and was bright-eyed until about 6:30am. It made for a long night for me (still recovering). Henry slept for several hours and were up and off to Frederick for a family dinner with Tara's mom and siblings and their families. All and all it made for a nice weekend, but for the lack of a little sleep. Today Henry has done fine and we've prepared him for his trip tomorrow. He's become very comfortable with the idea of these procedures as long as he's asleep for them. So we warn him and he says, "OK, but they'll put medicine in my tubies and I won't feel it, right?" And we're good. It'll be an early morning tomorrow. We need to be there by 8:15a. Seeing as how he and I both need to catch up on sleep anyway, I suppose going to bed early would be a good idea anyway! "It looks excellent!" Tara said to me as she was talking to the oncologist on our trip home from Baltimore for Henry's MRI. The relief was palpable. The day itself was not so stressful, in fact Henry was a trooper - hardly complaining about not being able to eat all morning - but the weeks and months leading up to this moment, knowing it was coming, afraid for the results, yet hopeful, but wary...We'd prepared for lukewarm news. The first read of the scan reports that all of the cancer that previously surrounded the lining of Henry's brain is gone. In addition, there is no recurrence at the original tumor site. The areas on his spine that were noted on his original MRI remain, but look smaller and less significant. It is unclear if they represent cancer cells or something less ominous like scarring or inflammation. This quickly crystallized in my head to mean that the chemotherapy is working brilliantly. We will continue with the high-dose treatment as planned after some follow up testing next week. Other conclusions washed over me as we continued the drive home. The odds for Henry's survival go up. The chance of needing radiation therapy go down, sparing him the threat of brain damage or other dysfunctions. As difficult as the next phase of chemotherapy will be, we'll have the comfort of knowing, not just guessing, that its working. Sheaves of worry lifted from my shoulders as I considered it all. Tears in my eyes, but why? Just happy I guess. We were braced for harsh reality and got handed another chance.